Moving the Needle: Jose Bautista brings the Jays back with his third homer of the season, +.455 WPA. This game unfolded oddly. For starters, Chris Ray was in for the eighth inning of a one-run game. I dunno, maybe he has something left in the tank. But it doesn’t seem that way. Second, with a runner on first and none out, Corey Patterson laid down a sac bunt. 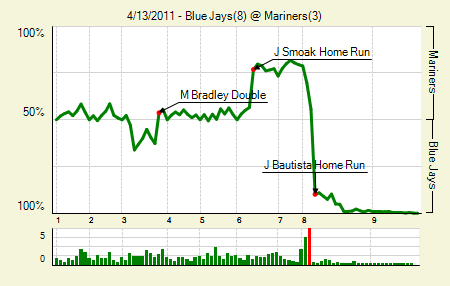 I had this one on the radio, and the Mariners guys seemed to think that Justin Smoak could have made a play on it. Instead he just watched it, and it stayed on the infield grass, which meant two on and none out for Bautista, who laid into one and hit it way out to left. Milton Bradley gave it the courtesy chase, but it was immediately apparent that it was goodbye baseball. Jason Vargas: 6.2 IP, 5 H, 1 R, 1 ER, 1 BB, 7 K. Six strikeouts in his first start, and now seven in this one for Vargas. Quite impressive for a guy with a 5.66 career K/9. Yunel Escobar: 3 for 5, 1 2B. His single to lead off the eighth started the comeback. Moving the Needle: Mike Aviles doubles into the gap and extends the Royals’ lead, +.129 WPA. The Royals held a 6-1 lead in this one, but the Twins battled back in the fourth and fifth. 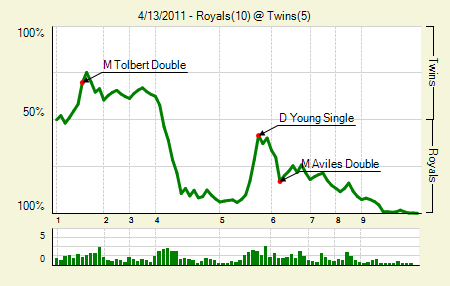 Delmon Young matched Aviles’s +.129 WPA play when he singled home a pair to bring the Twins within one run. But that was as close as they’d get. Aviles’s gap double scored Wilson Betemit all the way from first to give the Royals a two-run lead. He also doubled down the third base line earlier in the game. Francisco Liriano: 5 IP, 8 H, 7 R, 7 ER, 1 BB, 4 K, 0 HR. The story was that Ron Gardenhire and pitching coach Rick Anderson had been encouraging Liriano to pitch to contact. It clearly didn’t work here, but the “pitch to contact” mantra probably has little to do with it. Liriano has gotten lit up all year. Alex Gordon : 2 for 5, 1 2B. It’s been mostly singles and doubles for him so far, but he’s made it work, with a .346/.382/.519 line in 55 PA.
Moving the Needle: Brandon Inge gives the Tigers two walk-offs in two days, +.419 WPA. I’ve never had a walk-off hit, never mind a walk-off hit in a major league game. But I can only imagine the adrenaline high Inge experienced after this one. He had to know that ball was gone the second he made contact. That feeling — I dunno, I can think of about a thousand inappropriate things I’d do after that. In any case, it was a great series closer for the Tigers. They’ll try to continue their recovery from a slow start on the West Coast this weekend. Max Scherzer : 6 IP, 6 H, 2 R, 2 ER, 2 BB, 7 K. He upped his pitch count early, but held on to finish his six and keep his team in the game. Moving the Needle: Cliff Pennington bloops a single to tie it in the ninth, +.324 WPA. And so for the second time in three games the White Sox bullpen blew a lead heading into the ninth. 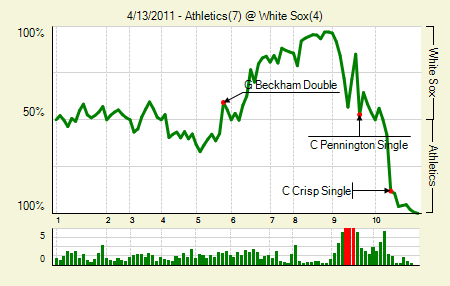 Chris Sale got first crack at this one, and he allowed a double and a pair of singles, making it a 4-2 game. Jesse Crain walked a guy and then struck one out, which left the ball in the left hand of Matt Thornton. He, too, got a strikeout, but then Pennington dunked one into shallow center, scoring the tying runs. 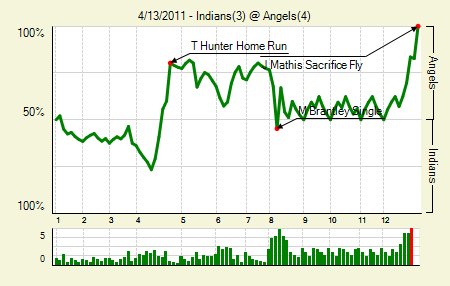 An inning later, Thornton would walk a pair and then give up the winning runs. John Danks : 8 IP, 5 H, 1 R, 1 ER, 3 BB, 7 K, 1 HR. Bullpens will blow games, but to have them spoil a start like this two days after they blew a similarly strong one by Mark Buehrle has to sting just a little bit more. Moving the Needle: Michael Brantley sets ’em up, +.224 WPA. Lame. Yeah, the Angels’ win was pretty obvious once Chad Durbin uncorked a wild pitch to put runners on second and third with one out. Durbin didn’t seem to have much of anything. Their only hope was that it was Jeff Mathis at the plate, but even he couldn’t mess this up. Brantley’s single put runners on first and third with none out in the eighth. Shin-Soo Choo would eventually score Brantley on a ground out, tying the game. It still wasn’t as interesting as anything that happened in the 12th, from the Vernon Wells single to the wild pitch to the Trumbo intentional walk. Hell, even Mathis’s sac fly. As for Brantley, he was 3 for 5 with a double on the game. Howie Kendrick : 1 for 5, 1 2B. It’d be tough to say this is the year he puts it together, since he’s hit like this in the past before getting hurt or slumping. But he’s been carrying the Angels’ offense to this point. Moving the Needle: Chris Coghlan singles home two, +.089 WPA. No, there was not much needle moving in this one. 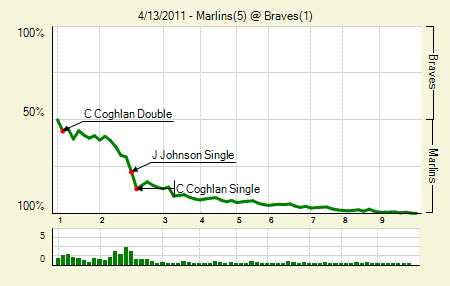 The Marlins went up 5-0 by the third, and the Braves were getting nothing done on offense, which makes for a WPA line that slowly and steadily creeps toward 100%. At least his one has a story to go along with it. Coghlan was 3 for 4 with a double on the day. Josh Johnson: 7.1 IP, 1 H, 0 R, 3 BB, 9 K. Yes, he had that no-hitter going through seven and one out into the eighth. It was a disappointment to see him leave after 7.1, since it’s always fun to watch Johnson pitch. But at 109 pitches and with a 5-0 lead, the decision was easily understandable. Moving the Needle: Colby Rasmus doubles the Cardinals lead, +.141 WPA. Ian Kennedy did not have a fun time with the Cardinals lineup. Things could have been a lot worse, too, as they loaded the bases with one out in the first and only came through with a pair. Kennedy wouldn’t get so lucky in the second. With two outs he plunked Ryan Theriot, which brought Rasmus to the plate. His double into the right field corner scored both base runners, and I’m just a little surprised he didn’t make it all the way to third. Still, that blew the game open. The Cardinals would seal it three batters later. Lance Berkman : 1 for 3, 1 HR, 1 BB. 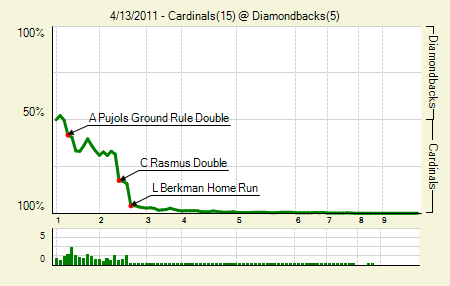 Berkman hit three spots behind Rasmus, and when he came up he had the bases full of Cardinals. What does one do in that situation, when facing a pitcher who probably shouldn’t still be in the game? Make him pay with a granny, of course. Kennedy actually stayed on to pitch the third, and allowed a pair of doubles to the No. 8 hitter and the friggin pitcher. Albert Pujols : 2 for 3, 1 2B, 1 BB. The two players who surround him on the wOBA leader board: Mike Aviles and Kila Ka’aihue. That’s just not where Albert belongs. 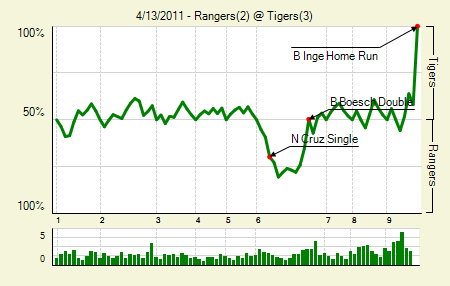 Moving the Needle: Ivan Rodriguez strikes out with the tying run in scoring position, -.165 WPA. I was honestly hoping that the bottom of the ninth would factor into this. Not that I get any extra pleasure out of players failing in the clutch. 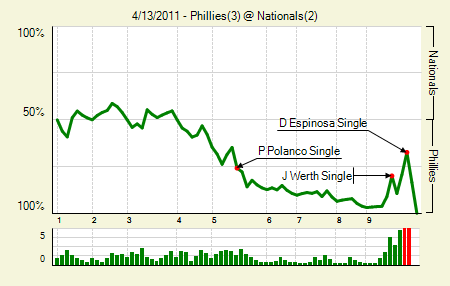 It’s just that the Nats went into that bottom of the ninth down 3-0, still facing Roy Halladay, who had given up just two hits and two walks (plus a hit batsman) to that point. Rick Ankiel got the Nats started with a double, and Jayson Werth followed with a single to put runners on the corners with none out. A pair of singles by Laynce Nix and Danny Espinosa brought the Nats to within one, still with one out, and with the tying run 180 feet away. That apparently annoyed Mr. Halladay, who struck out both Matt Stairs and Pudge to end the game. It was a rousing comeback attempt, and I was legitimately disappointed when it ended. Roy Halladay: 9 IP, 6 H, 2 R, 2 ER, 2 BB, 9 K, 0 HR. Those were only his second and third earned runs allowed this year. Last season through three starts he also had allowed only three earned runs. Only last year he had thrown 24 innings. This year it’s just 22. Come on, Roy! Moving the Needle: Alex Rodriguez opens the scoring with a three-run homer, +.191 WPA. Orioles starter Chris Tillman is such an odd case. This year he has struck out 11 in 12.1 innings, but owns a 3.9% swinging strike rate. Last night he induced just one swing and miss. Such futility is not good against any team, but it’s especially troubling against one of the league’s best offenses. 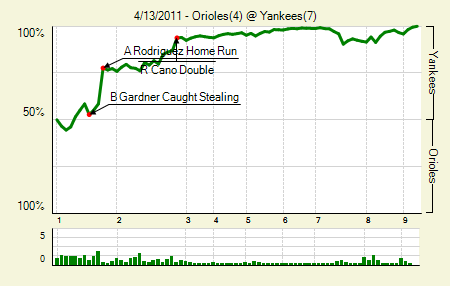 He allowed hits to the first three hitters, but Brett Gardner got caught stealing. Rodriguez would make everyone quickly forget Gardner’s miscue, lining a bullet over the wall in right for a quick 3-0 lead. The Yankees ended up hanging three more on Tillman before he finally exited. Mark Teixeira: 2 for 3, 1 BB. He’d been mired in something of a slump. Before last night four of his six hits on the season were homers. Now it’s just four of eight. Matt Wieters: 2 for 3, 1 2B, 1 HR, 1 BB. That was his fourth career homer at Yankee Stadium, where he has more home runs than in any other opponents’ parks. 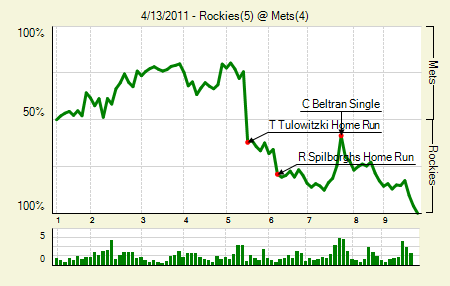 Moving the Needle: Troy Tulowitzki homers to put the Rox ahead, +.377 WPA. I’m just going to create a macro for Tulo having the high WPA for the Rockies. Anyway, it’s not exactly easy to hit a home run at Citi Field. The fences are far back and high. But there’s this little cove in the right field corner where you can pop one. Tulowitzki did just that in the fifth, lining a pea over the fence to drive in three and give the Rockies a 4-3 lead. It was Tulo’s fifth of the year. He also doubled in the game. He has 11 hits this season, so nearly half are homers. Eight have gone for extra bases, and he has a homer in each of his two games at Citi. If we’re casting early MVP ballots, he’s got my vote. Jonathan Herrera: 2 for 4, 1 2B, 1 BB. With playing time at second base basically up for grabs, Herrera has done his best to lay claim to the position. If he can sustain that .630 OBP he’s really going to help this team. Carlos Beltran: 2 for 4, 1 2B, 1 BB. Contract year Beltran is getting it done. If he stays healthy I can see his BA and walk rate jumping as he gets in a groove, too. 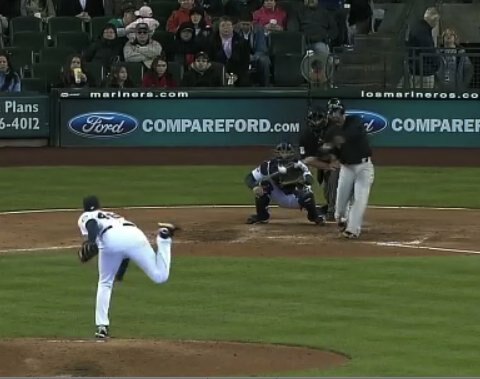 Moving the Needle: Prince Fielder ruins a perfectly good Kevin Correia start, +.255 WPA. Through five we had a scoreless game at PNC Park, but in the sixth things unraveled for the Bucs. A double, a bunt single on a sac bunt attempt, and a sac fly brought home the first run. That’s all fine and good, but that also meant the heart of the order was due up. 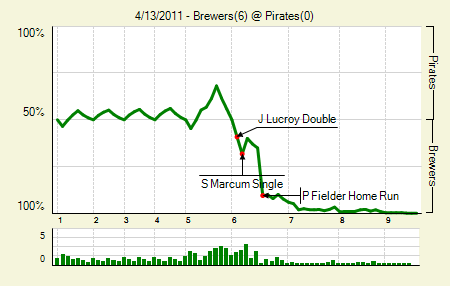 Ryan Braun singled, and then Prince Fielder hit one way long that completely sank the Pirates’ chances. Shaun Marcum: 7 IP, 4 R, 0 R, 1 BB, 4 K. After a rough first start for Milwaukee, he’s really come through his past two turns. Neither he nor the bullpen allowed an extra base hit. Moving the Needle: Orlando Hudson walks off with a bases loaded single, +.351 WPA. While the books show a blown save and a loss for Nick Masset, this one wasn’t totally on him. Aroldis Chapman came on to hold a 2-1 Reds lead in the eighth, but something was amiss. He maxed at 93.7 mph, which is just not Chapman-like. He had maxed at 98.3 the previous night, and had also maxed around there in his previous appearance (which was the second of back-to-back appearances). In any case, Dusty Baker lifted Chapman after two batters, double switching in catcher Ryan Hanigan in the process. Hudson, who had just reached on a fielder’s choice, took advantage of the new catcher and swiped second, taking third on the poor throw. It took only a ground out to tie the game. The ninth, though? That was Masset’s fault. 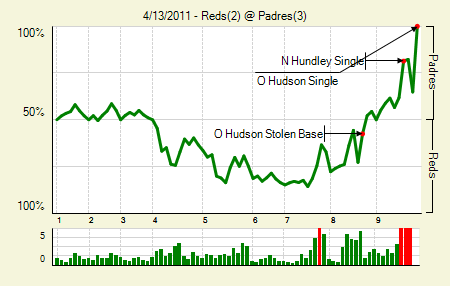 He loaded the bases before allowing the opposite field single to Hudson, which allowed the Padres to avoid the sweep. Joey Votto: 3 for 4, 1 2B. His .509 wOBA actually ranks only fourth in the league. Fourth? C’mon, Votto. You’re an MVP. You can’t go falling behind three other dudes. Moving the Needle: Rod Barajas again does the one good thing Rod Barajas can do, +.237 WPA. I’m not the biggest Barajas fan, but I won’t deny that he can knock a few out of the park. He hit another one yesterday, a two-run shot in the fourth that tied the game. There were actually four WPA swings of .200 or greater in this one, making it the likely game of the night. 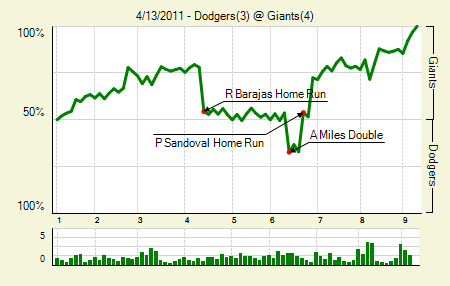 Aaron Miles put the Dodgers ahead in the sixth with an RBI double (+.210), but the Giants came back to tie it on a Pablo Sandoval home run (+.209) and then go ahead on a Mike Fontenot blast (+.209). If you’re bored and need a baseball fix, watch the sixth inning of this one, both top and bottom. Entertainment of the highest order. Aaron Rowand: 2 for 4, 1 2B. Apparently he doesn’t take well to being an afterthought in the World Series. He’s opened 2011 with a bang, going 11 for 30 with a homer, two doubles, and a triple. The only thing he hasn’t done this season is draw a walk. Moving the Needle: Jeff Baker smacks one into the corner to give the Cubs an early lead, +.201 WPA. The Cubs jumped ahead early in this one, and it was a good thing they did. In fact, the most important hit of the game might have been Carlos Zambrano’s homer in the sixth. 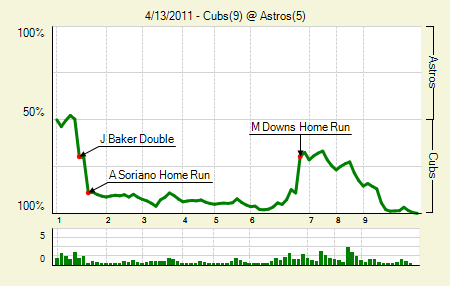 That put the Cubs up 6-0, but Zambrano promptly gave back five runs in the bottom half. The Cubs weren’t done scoring, though, and they’d again pull away in the later innings. Alfonso Soriano: 1 for 4, 1 HR. His three-run blast in the first put the Cubs up 5-0. It was his fourth homer of the season, though he hasn’t done much of anything else. Matt Downs: 2 for 3, 1 2B, 1 HR, 1 BB. In 13 PA the guy has doubled three times, homered once, and walked once. That’s four extra base hits to just one single. We hoped you liked reading The Morning After: Game Recaps for April 13th by Joe Pawlikowski! Worth pointing out, regarding Liriano, that of the 19 BIP that he allowed, the breakdown of type was 15 GB, 3 FB, 1 LD. This was not a case where Liriano was getting “lit up”, but rather running into one inning where every ground ball found a hole in the Twins “defense”. Personally, I took encouragement from this start, especially as compared to the unevenness of his first 2 starts. …and he was great for me in ottoneu!